Creatine is one of the most popular supplements out there, because it works. Here’s how it can improve your workouts and make you more muscular. Creatine can increase muscle strength, help you work harder for longer in the gym, and give you a bigger muscle pump. It’s also very safe, so there’s no reason not to add this effective supplement to your stack. Creatine is a combination of three different amino acids: glycine, arginine, and methionine. That's it—nothing more than a combination of amino acids. I don't know how many people I hear talk about creatine and call it a steroid! I almost flip my lid when I hear that. No, creatine is not a steroid, it is totally different and works in a different manner. Creatine is also produced by the body and found in certain high-protein foods such as fish and red meat. It is not a lab synthesized compound, it is natural. It is also not a stimulant, although it is sometimes combined with stimulant ingredients like caffeine in pre-workout formulas. After creatine enters the body (or after it is produced by the body) it firsts binds with a phosphate molecule to form creatine phosphate. Now here is where I'm going to lay a bit of biochemistry on you, so I'll do my best to keep it simple. ATP (adenosine tri-phosphate) is the body's energy source. When your body oxidizes carbs, protein, or fat, it is doing this process in order to produce ATP. ATP is the energy responsible for driving almost every body process there is. (ATP is even involved in creating more ATP.) ATP provides this energy by hydrolyzing a phosphate group. ADP is pretty much useless in the body unless it is converted back into ATP. Now this is where creatine comes into play. The creatine works by donating its phosphate group to the ADP to re-form ATP! I assume you see where this is going. 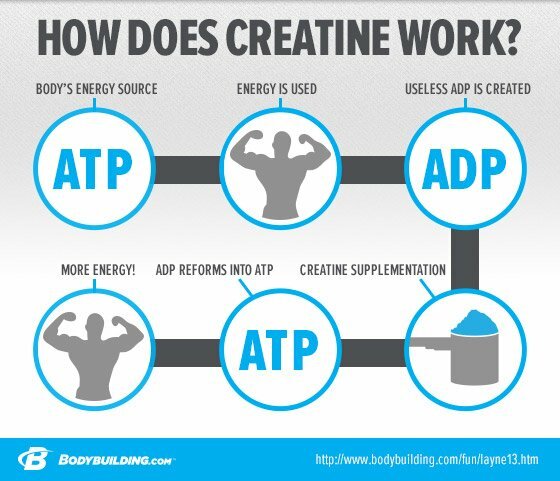 By allowing you to return ADP to ATP, creatine will increase your ATP stores, thus allowing you to train harder and longer. Supplementing with creatine can help you produce more ATP so you can increase your workout intensity, which is especially beneficial for athletic activities involving short, fast, explosive movements. Another benefit of creatine is that creatine itself is a fuel source. In fact, your body's first choice of energy when performing anaerobic activity (such as weightlifting) is your creatine phosphate stores. By supplementing with creatine phosphate you will increase these stores, thus giving you more energy for your workouts. There is another anabolic property that creatine holds and this is its ability to hydrate muscle cells.2 When muscle cells are hydrated a few things happen, the most notable being an increase in protein synthesis. Plus, when your muscles hold more water, they look bigger and more pumped up. While creatine is most popular with strength athletes, it has a number of other potential effects, such as better brain performance, glucose metabolism, and bone mineral density, that make it a supplement that can benefit everybody. Many studies have been done on creatine and it has been established to be a safe supplement to take.3 While some people experience side effects like stomachaches, this is usually due to taking too much creatine at once or taking it on an empty stomach. Ciaran Fairman explains this and other common misconceptions in the article "6 Side Effects of Creatine: Myths Debunked." It is not necessary to load creatine, but it can help you see results faster. To get the full benefit of creatine you must saturate your muscle cells with it. Using a small dose (5 grams), saturation will take up to 30 days, depending on the individual's lean body mass. However, by using a loading dosage of 15-25 grams per day for five days you can quickly saturate your muscle cells, then use a maintenance dosage (3-5 grams) to keep your creatine levels high. It is not necessary to do so, but it can help. Your body has an internal equilibrium which you can swing in your favor for a duration of time, but over time that equilibrium will eventually swing back. This means that taking excess creatine for a short period of time (4-8 weeks) may temporarily increase your creatine phosphate stores, but after a while your body's feedback mechanisms will likely bring the levels back down to normal. This mechanism may be to decrease your body's own production of creatine or to downgrade the number of receptors that admit creatine into the cell. Taking time off from creatine can help bring your body's equilibrium back into a state wherein taking excess creatine will be beneficial again. Insulin helps drive more creatine into muscle cells. In your post-workout meal you should be eating foods that help spike your insulin. If this is the case, then taking creatine with this meal will help its uptake into muscle cells. The body absorbs many nutrients better after a workout. The creatine supplement will help refuel your body's low creatine phosphate stores. Will Taking Creatine Before a Workout Give Me More Energy? No, not exactly. Once again, for creatine to work your muscle cells must be saturated with it. This takes at least a week to do, so doing it once before a workout will not make a difference. Even if your cells are already saturated with creatine, it will still not make a difference if you take it before you work out. Your body must process it first and that takes time. The creatine your body will use in the upcoming workout will come from the creatine phosphate stores already in the cells, not from the creatine you just ingested. Most certainly not. Creatine degrades in water over time into its waste product creatinine, which is useless in the body and will simply be excreted. Companies who claim that they have stabilized creatine in a liquid are flat-out lying to you. As Nick Coker explains in his article, "Which Form of Creatine Is Right for You? ", creatine monohydrate is the form of creatine that has been the most studied and is used by the most people, with excellent results. While there are other products hitting the market, like buffered creatine and creatine nitrate, these aren’t backed up by research that proves they’re any better than creatine monohydrate. I recommend that you stick with the tried and tested. Stoll, B., Gerok, W., Lang, F., & Haussinger, D. (1992). Liver cell volume and protein synthesis. Biochemical Journal, 287(1), 217-222. Greenwood, M., Kreider, R. B., Greenwood, L., Willoughby, D., & Byars, A. (2003). The effects of creatine supplementation on cramping and injury occurrence during college baseball training and competition. Journal of Exercise Physiology Online, 6(4).